Imagine a loaded baked potato full of sharp cheddar and crispy bacon bits and sour cream and onion tops. In a muffin. No kidding. I think this is my favorite muffin so far. Have I said that before? Probably. But this time I really, really mean it. I ate two back to back, standing at the kitchen counter. And then I had to go sit down and clutch my chest. So rich, so good. Serve them with a salad and call them lunch. Or dinner. But make these muffins. Fry your bacon until it is crispy. Set on paper towels to drain. I use a single piece of paper towel on top of newspaper. Keeps the ink off the bacon and doesn't waste a bunch of paper towels. If your potato is thin-skinned, by all means, leave the peel on, otherwise peel it. Then cut it into small squares. Fry the potato pieces in the bacon grease until fork tender and nicely golden on all sides. Set aside to cool. Preheat your oven to 350°F or 180°C and liberally grease your 12-cup muffin pan. Chop your green onions and bacon into little pieces and grate your cheddar cheese. Set aside a little of each to use for topping later. In a large mixing bowl, combine your flour, salt, sugar and baking powder. Add in the grated cheese, bacon bits and green onions. Stir well. Add in the cooled potatoes and stir again. In a smaller mixing bowl, whisk your egg, milk, sour cream and oil. Fold your liquids into the dry ingredients. Divide the batter between the prepared cups in the muffin pan. Top each with some of the reserved cheddar, onion tops and bacon bits. Bake in your preheated oven for 20-25 minutes or until the muffins are lovely and golden. Allow to cool in the pan for a few minutes then remove to a wire rack to continue cooling. You may need to run a knife around the edges if the cheese is sticking to the pan. These are fabulous warm and almost as good cold! I definitely don't make enough savory muffins but this loaded baked potato version is calling to me! Such a fun flavor profile! OMIGOD HOW GOOD IS THIS???!! SO good. 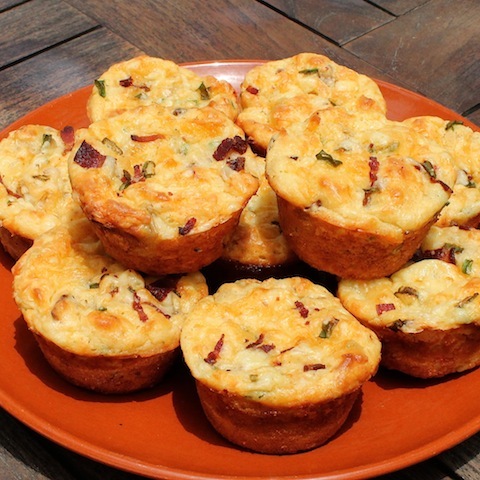 Love these savory muffins! Holy Kamoly! This sounds fantastic - Mr. Picky Eater would LOVE these!! Must pin and make them. Thanks, Joanne! I am not even kidding a little bit when I say these are my favorite muffin so far. Me too, Kayle! I am embarrassed to admit it, but over a couple of days, I ate almost the whole dozen, with just a little help from my husband. I have added them to RecipeNewz, Kelli, so pin away. :) Thank you! I actually prefer savoury muffins to sweet albeit it not easy on the old waistline! I'll give these a go for brunch one weekend I reckon. These were so rich, Nancy! Definitely not waistline friendly. OMG! I think I have all the ingredients...off to the kitchen I go. Mine are in the oven now! Can't wait to taste them!!! How did they turn out, Shawna? I hope you enjoyed them, Christy! Please let me know.